It was my first time to visit Citywalk. I've heard so many good things about this place, and finally I made it here. 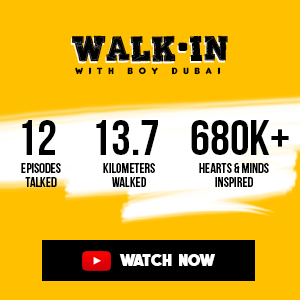 This vibrant dining and shopping haven at Al Wasl corner Al Safa Road in Jumeirah 1, Dubai features a posh strip of restaurants that invites every visitor to hangout for a sumptuous digestive indulgence. Every dining stop has their own al fresco setup that promises amazing views and experiences during the colder season. A well-lit water fountain and the Burj Khalifa set in the background. But it was hot and hazy outside even for a stroll so we went straight to dinner. With my wife and my 2-year old girl, we headed to Mo's - an American fine dining, all-day restaurant with a cozy ambiance and very warm staff. We were ushered to the best area for family. The manager walked in our table with all smile. He allowed us to learn more about the restaurant. Mo's, a part of the Caramel Group, is a family-oriented casual dining serving contemporary American dishes with a twist. The restaurant serves breakfast, lunch and dinner. A server politely introduced herself and asked for our preferred refreshments above anything else. Root Beer Float for me, Lemon Iced Tea for the wife. I'm a huge fan of root beer float and glad to find one on the menu. We had Queso Fundido for appetizers - turkey chorizo and velveeta cheese in crispy nachos and soft tortilla. Definitely beyond you traditional starter bites. I don't usually order salads when dining out, but the wife insisted. Okay. We asked our server what would be best for us and for the little one as well. BBQ Chicken Salad turned out as one of the best salad I've ever had in a restaurant. From its presentation to the taste, the experience on this mix of ranch-flavored chicken barbecue chunks, cut crispy onion rings, avocado slices, grilled corn bits, black beans, pico de gallo, and shreds of cheese, is exceptional. For the mains, we had Chicken Alfredo, Baconator Beef Burger, which the server asked how we'd like it (well-done) and their top-seller and signature entree... wait for it... the TNT Shrimp Tacos! Man, TNT Shrimp Tacos is a champ! These mouthwatering, mildly-spiced battered shrimps come wrapped in 6 soft tacos with shreds of lettuce in it. Guacamole, Pico De Gallo Slaw and Sour Cream Chipotle Mayo are served with it - and all of them taste really good with the piquant-flavored shrimp and altogether as well. Explosive it is! Now the Baconator Beef Burger. By this time, we're almost full, but no, that doesn't mean we're passing on this one. A bite was followed by another one, and another, and another. ;-) The thick juicy well-done burger patty comes with crispy veal bacon with onions, lettuce and tomatoes in their freshly-baked soft buns. It is served with bbq sauce. And, yes indeed, we were warned of the huge serving size. Chicken Alfredo is 'chicken alfredo.' This fresh fettuccini pasta comes with lots of chicken chunks and rich and creamy parmesan sauce. Mo's has a Just For Kid's menu which makes it a perfectly fine dining destination for families. Mac n Cheese is what we chose for our baby. Even the kids meals comes in huge serving. Baby Aya said 'yum yum' and yes indeed it was so tasty that kiddos will surely love it. We had to beg off from desserts. I know I know. They have an extensive range of sundaes, shakes and cakes. As much as we'd love to, we really love to, there's just absolutely no room left for one. This is what we'll not miss on our next visit for sure. Yes, we are definitely coming back to Mo's. I'd bring my friends and visitors for a perfectly fine dining experience - quality food and great service on a fine relaxing environment. Mo's is located at Citywalk, Al Safa road side. For further inquiries and reservation, call them at 04-3443305 or email mos@caramelgroup.com. You can call them 30-45 minutes ahead to pre-order your meals and just stop over Al Safa road side and they'll bring your order to your car. If you have what it takes, finish one whole party sundae in 30 minutes and you'll not have to pay for it. The (in)famous Mo's party sundae is 8 scoops of ice cream (your choice of flavor), brownie square and 4 bananas, topped with caramel sauce, hot fudge, whipped cream, toasted almonds, chocolate sprinkles and 8 Maraschino cherries. Now can you handle it? 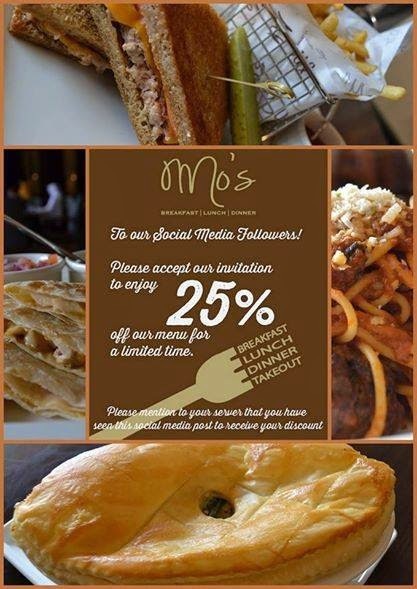 Follow Mo's on Facebook, Twitter and/or Instagram and get 25% off. 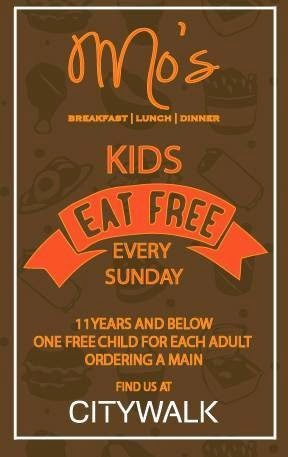 Children 11 years and below eat for free every Sunday all-day - one free child for each adult ordering a main.